As a Catholic co-educational College we focus on the importance of belonging to our community, strongly encouraging each student to discover his or her God-given talents. These gifts are to be developed, not for self-satisfaction or self-gain, but rather, with the help of God, for the good of the community. To provide opportunities for students to encounter the person of Christ as friend and guide, coming to know Him through Scripture, sacraments, personal and communal prayer, in play and work and in other persons, leading to the service of others in imitation of Christ. Saint Ignatius Loyola (1491-1556), founder of the Society of Jesus (also known as the Jesuits) and College Patron, lived a life of Giving Glory to God through prayer and service to others. 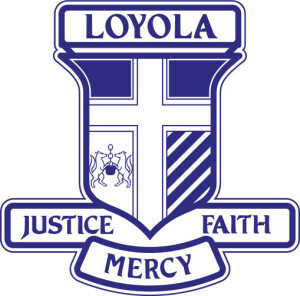 Loyola College’s ethos is based on the Ignatian tradition. Inspired by the spiritual and educational philosophy of Saint Ignatius of Loyola, known as the Ignatian tradition, Loyola College seeks excellence in the fourfold dynamic of Catholic, Care, Curriculum and Co-Curriculum, developing articulate, adaptable, discerning and confident graduates of conscience committed to living the values of Jesus Christ in a global community. Each year the College proclaims a theme that articulates an aspect of our Catholic Ignatian tradition. This theme becomes a practical focus for the College community to bring alive and enact our Catholic heritage. St Ignatius Loyola (1491-1556), founder of the Society of Jesus (also known as the Jesuits) and College Patron, lived a life of prayer and service to others. He referred to himself as the pilgrim and those around him as companions – friends in the Lord. The 2019 College Theme, Companions in the spirit of Ignatius, calls us to imitate the example of St Ignatius. Ignatius believed that everybody was known and loved by God and hence must be valued and respected. The created person was inherently good and their life long mission was to find the best way they could serve God. This was not necessarily an individual pursuit. Rather, great things for God could be achieved by people working together. Ignatius was a practical person. He encouraged people to dream and become aware of God’s spirit. He believed in being courageous and discerning in striving for the greater good. The College Theme was designed by students from the design club, under the direction of Ms. Alexis Winter and Ms Julia O’Brien. Students participate College, house, level, mentor and class prayer and liturgies. In all celebrations they take active roles through reading, serving, singing or providing reflections. These include Opening Mass, Saint Ignatius Day Mass, Year Twelve Graduation Mass, Class Masses, Fathers’ and Mothers’ Day liturgies, Grandparents Mass, Memorial Mass, Parish House Masses and ANZAC and the Sorry Day ceremonies. Year Twelve students conduct the Ash Wednesday ceremony for the younger students and are leaders for their respective retreats. Saint Ignatius Loyola has had a profound influence on the Catholic Church over the past 500 years. He was a mystic who encouraged his companions to pray the Prayer of the Examen. Ignatius looked for the action of God in the everyday. He was reflective and open to the guidance of the Holy Spirit in determining the direction of his life. For Ignatius this meant making life enhancing decisions and choosing the better from amongst the good. Our whole College community stops at Midday each Monday and comes together in class and other small groups to pray the Examen together. The prayer of the Examen is a reflection of Ignatian Spirituality. There are five guided steps: Gratitude, asking the Holy Spirit for insight, reflecting on the day and noticing the presence of God, asking for forgiveness and finally, looking towards the future. Established in 1980 and set on 27 acres in Watsonia, Loyola College serves north-eastern Melbourne and, by special arrangement, accepts international students. Over many years Loyola has maintained strong links with its constituent parishes and developed links with other parishes. A comprehensive education is provided for young women and men, including an emphasis on active participation in one’s local parish. The land on which Loyola College was built was donated to the Archdiocese of Melbourne by the Society of Jesus (Jesuits) in 1979 for the purpose of building a Catholic secondary school. The Jesuit Order had a presence on the site from 1934 to 1974 where a house of formation and studies for the Society of Jesus was located (the current Old Loyola building was purchased by the College in 2002). Loyola College is a member of the Ignatian Network, a group of Jesuit and non-Jesuit schools in Australasia together with others worldwide. At Loyola College, parental engagement with teachers in monitoring a student’s growth and learning is a necessary commitment. In exercising a choice to send their child to Loyola College, parents are not only responding to a desire for Catholic education but signalling a wish to enter a community school on these terms. The College is dependent on parents and the wider community for their contribution, including time given at meetings and for supporting staff in their work. Our Motto “Justice, Mercy, Faith” is a call to action for our young people and offers guidelines for a life of Christian service, which is inspired by the life and teachings of Saint Ignatius of Loyola. The five bars on the Emblem represent Loyola’s five founding parishes: St Damian’s, Bundoora; Sacred Heart, Diamond Creek; St Mary’s, Greensborough; Our Lady of the Way, Kingsbury and St Martin of Tours’, Macleod. Loyola College has since welcomed St Francis of Assisi, Mill Park and St Thomas’, North Greensborough. The College also serves the parishes of St Francis Xavier, Montmorency, including Holy Trinity, Eltham North and Our Lady Help of Christians, Eltham. 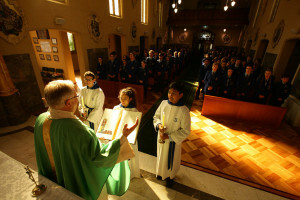 Active participation in a student’s local parish is emphasised. The two wolves eating at a cauldron are taken from the heraldic crest carved in the lintel on Saint Ignatius’ family home in Loyola, Spain. The imagery refers to the prosperity and hospitality of the Loyola family who, after feeding family, retainers and soldiers, had food enough to feed the animals. Loyola College Archives was established in 2006 to acquire, organise and preserve items related to the cultural heritage of the College. The College Archives collects photographs, newspaper cuttings about the College, students and staff (past and present), sports and concert/drama programs, mass booklets, flyers, prospectus, uniforms, trophies, banners, diaries, newsletters – in fact, any memorabilia that documents the history of Loyola since it was planned in the late 70s. It is also collecting material about the history of Old Loyola. Retrospective donations of items are very welcome if they fill a gap in the collection. For donations or enquiries please contact the Archivist at Archives@loyola.vic.edu.au.